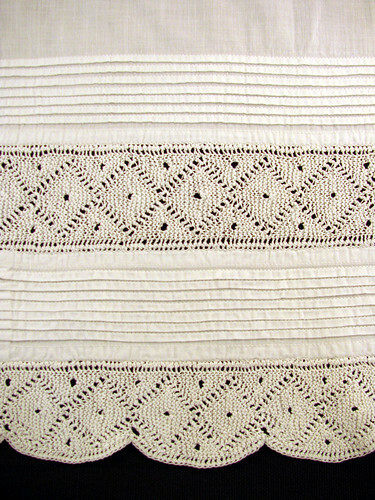 Here is how knitted lace was sewn onto petticoats in the 1890’s. This petticoat is made in the traditional way with two gathered layers from the knees down. As you can see the under layer has another ruffle added to its bottom. 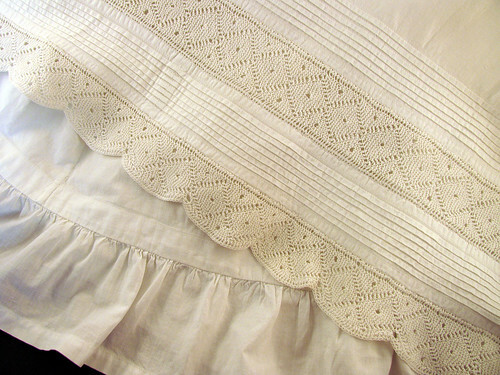 The tucking adds lots of body to the top ruffle. Both ruffles finish at the same length. The top of the petticoat is done in a five gore style with the center front panel flat while the side fronts and backs are gathered. It has a 25 inch waist and is made for a woman about 5’6″ tall, my height. The petticoat is in fairly good shape with only a few tears at the top. Each piece of lace is exactly 3 1/2 yards long. So there is almost twice the length of lace in this petticoat than the pieces I posted yesterday. That may explain why there is no hemstitching on each side of the the knitted lace as was in the other piece. Each loop of lace is hand stitched in place. So there is plenty of work in this petticoat without the additional hemstitching. This entry was posted on Monday, April 6th, 2009 at 3:00 am and is filed under Knitting, Lace, Sewing and Vintage. Tagged: Knitting, Lace, Sewing, Vintage. You can feed this entry. You can leave a response, or trackback from your own site. How gorgeous! Petticoats, knitting and the 1800s three of my favourite things.